On November 29, 2017, Hubbard Cincinnati hosted an Interactive Career Fair. Students had the option of choosing from three careers: The Culinary Arts, Radio (On-air/Production) and Firefighter. For the Culinary Arts presentation, we had two local chefs who prepared a few dishes with the students. For Radio, Jesse, Big Dave, Fritsch and Chelsie put together a spectacular piece of audio production with students. Rounding out the event, a Cincinnati Firefighter spoke with the children about his role. The Book Club was an exciting project that the Hubbard staff participated in along with their Adopt-A-Class pen pal. After reviewing some of the letters written by the pen pals this year and speaking with other staff members, we decided to develop a program that will strengthen the student’s literacy and writing skill. To that end, we introduced the Winton Hills Academy Book Club. As part of the Book Club, Hubbard staff members read the book along with the students. Throughout the months of February and March our staff visited the school to host discussions, games and activities on selected chapters. The project concluded in March with performances by the students. Students wrote original poems and performed them. Hubbard has generously purchased copies of the book for our staff. Hubbard hosted a special lunch for Winton Hills Academy students who are currently in the foster care system, as well as a homeless sibling group. 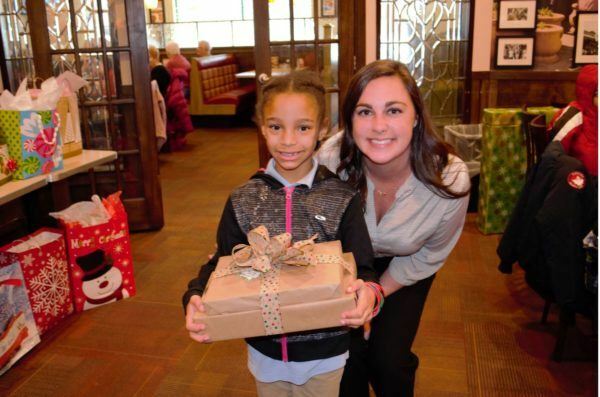 Each student received a Christmas gift purchased by Hubbard staffers. In addition, Hubbard was able to provide each foster family with a $50 grocery gift card for holiday shopping. The highlight of the day was the arrival of new shoes for all 15 of the students. The shoes were generously donated by Hubbard staff.